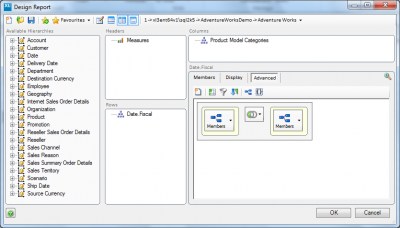 Workbook slicers – all for one and one for all! 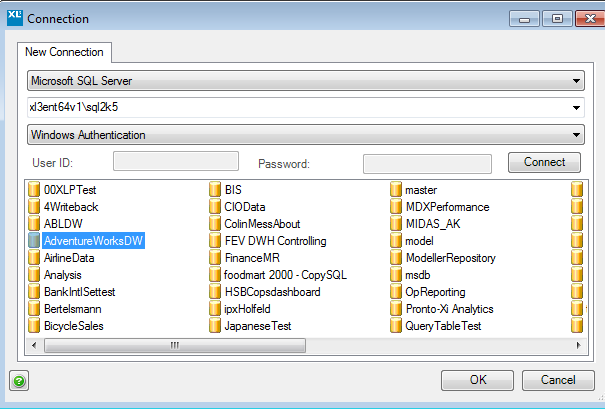 So this is our second blog on the new features of XLCubed v8 – today we’re going to run through workbook slicers. Workbook slicers allow the user to create the slicers at the workbook level so that they can be displayed for any/all sheets. There’s a slicer pane which can be arranged horizontally or vertically and stays in place when you navigate to another sheet. 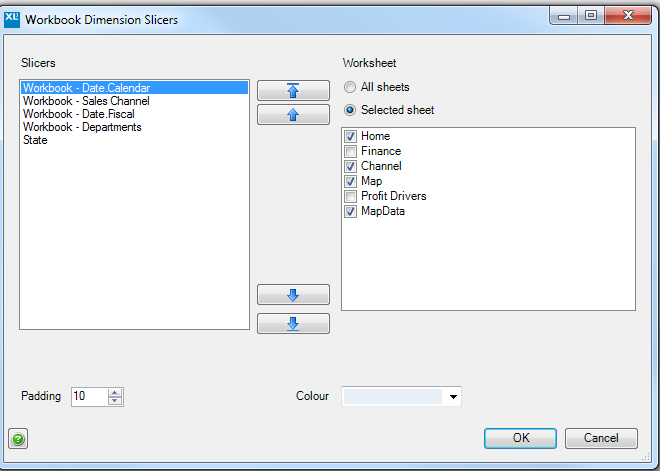 This means that if you have a multi-sheet workbook you only need to define one set of slicers. These can then configured to be shown or hidden for individual sheets as required. 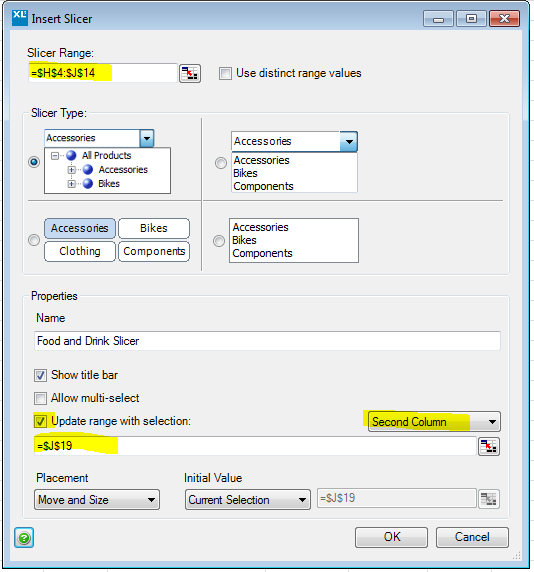 Within the slicer pane there’s an Add Slicer button – this brings up the standard design form for adding slicers. The Edit layout button brings up the window below. 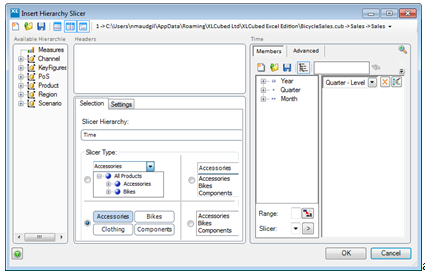 It allows you to configure the order in which slicers will appear on the pane, which sheets they will be visible on and the padding between individual slicers. You can also set a background fill colour from here. 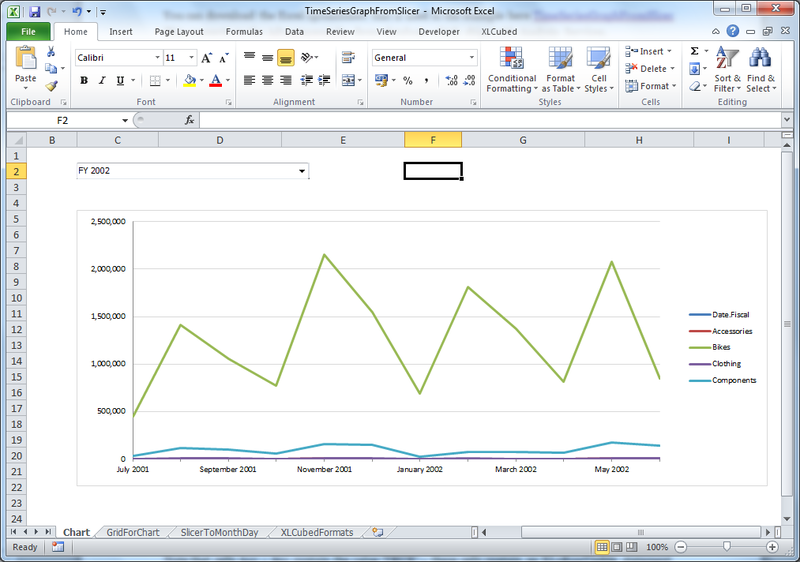 Once added, you link workbook slicers to your report in the same way as embedded slicers. 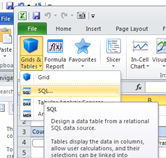 You can link directly to grids and other XLCubed objects and output their selection to Excel cell locations for use by formulae. 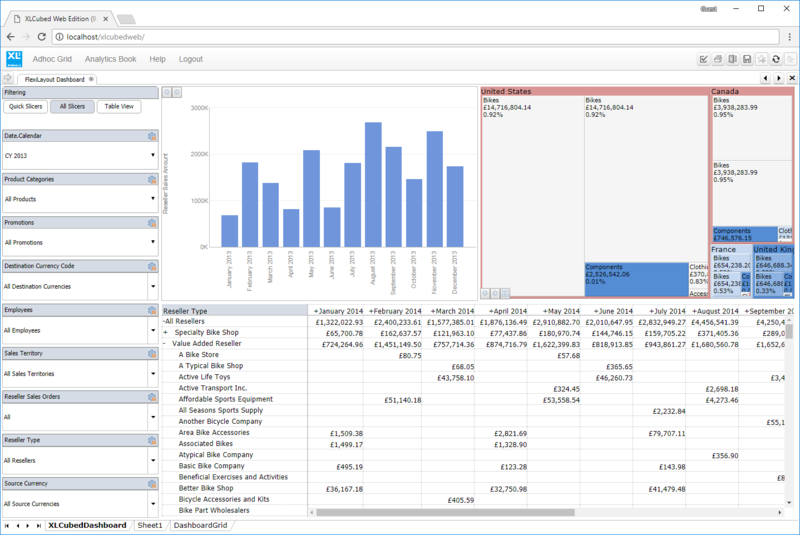 A common scenario for Analysis Services reporting is to want to present different measures for different members, particularly in budgeting and planning. 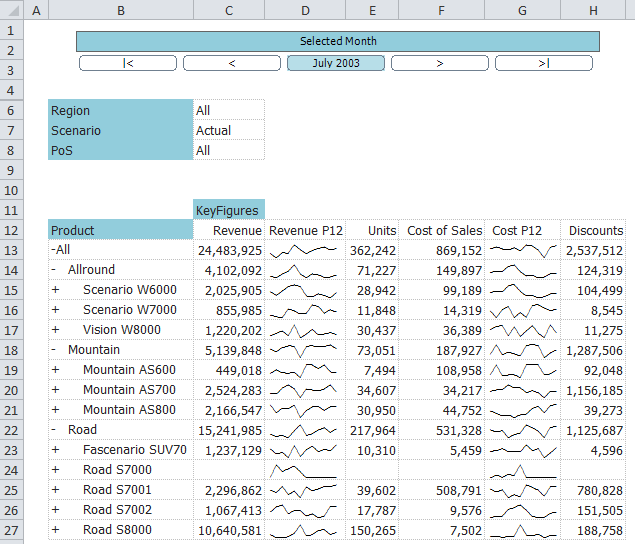 So I want a grid that shows actuals for previous month, budget for this month and forecasts for future months. This could be achieved in the cube, by using a “Phasing” measure to switch to the different values but quite often our customers are not in control of the cube structure. We will look at a way to achieve this from within XLCubed itself by working through an example. So this is our initial grid – it is currently set to report both Revenue and Discount values across all quarters in 2002 – 2004. 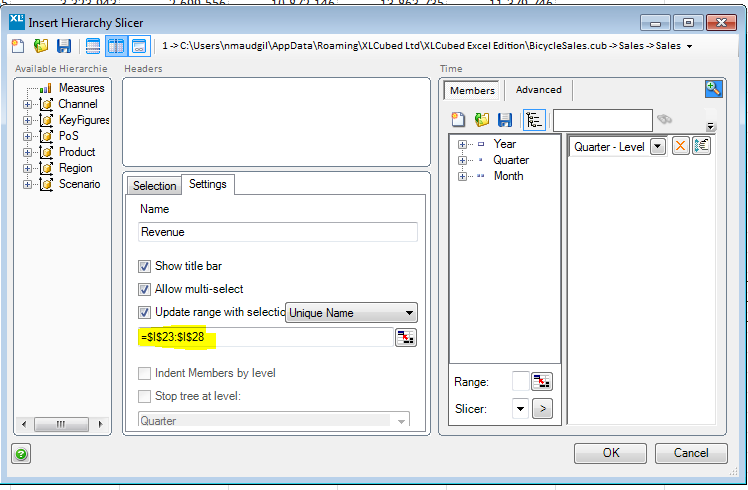 You can see that this is a multi-select slicer allows which updates an Excel range with the slicer choices. 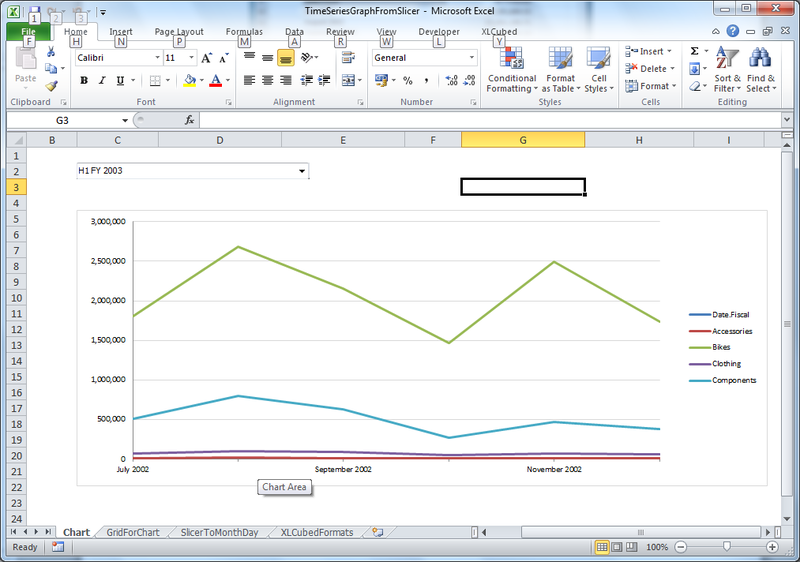 The entries in the Excel range are referred to by their ‘Unique Name’ eg for Quarter 2 2004 equates to April 2004. In this example our Discount slicer choices are Quarters 2 & 3 in 2004 and our Revenue slicer choices are Quarter 4, 2004. 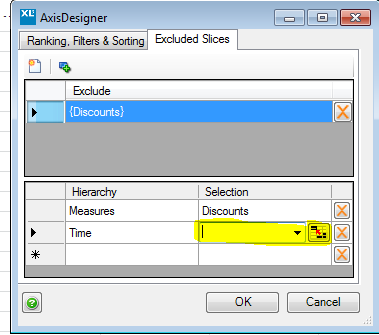 Now let’s set up the excluded data – remember that we when reporting Revenue rows we want to exclude the Discount slicer choices and vice versa. 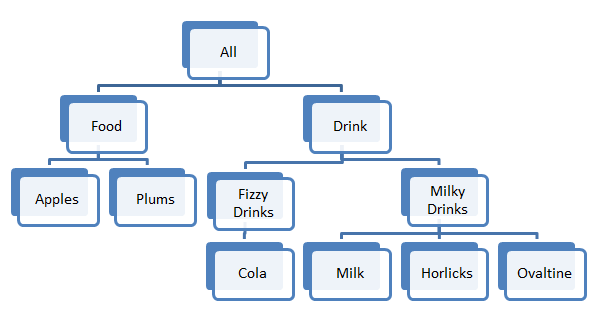 You will now see a red triangle appearing in the corner for the first member of the hierarchy which has excluded data. 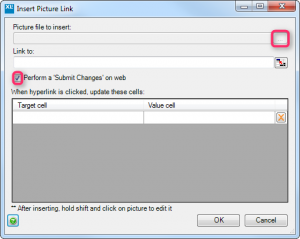 If you hover over this cell it displays an additional message that the rows are being restricted by members and that you should right-click to edit axis (it’s the menu option just after grid charts). In the Axis Designer window pick the Excluded Slicers tab and click in the lower-half of the window (highlighted) – this is where we are going to define the quarters that are to be excluded on the Time hierarchy. 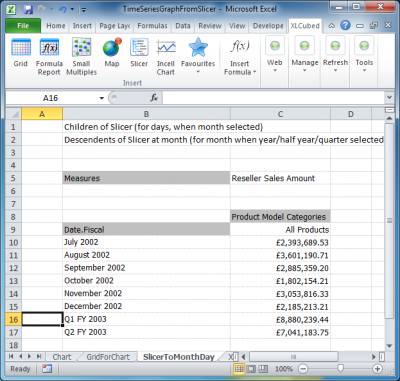 Select the time hierarchy and then click the box to its right (highlighted in screenshot below) and click the box next to the drop-down so that you can pick the Excel range – in our example it is cells I23 through to I28 (the Revenue slicer choices that we do not want reported as Discounts). 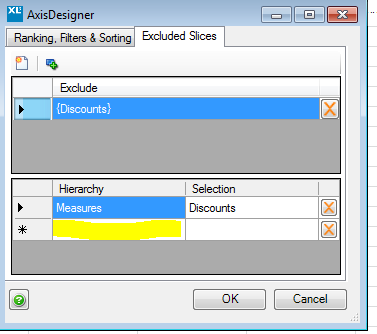 Clicking OK will refresh the report and only show Discounts rows for the quarters selected. 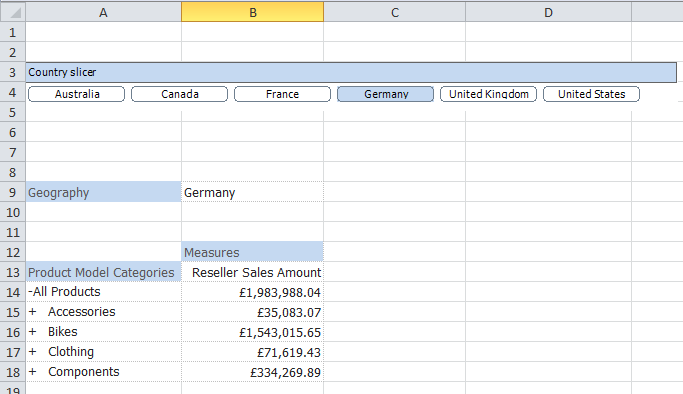 We now need to do the same for Revenue so right-click on the row containing the red triangle and set up the Revenue excluded slices in a similar way. Click the icon highlighted to add a new exclusion. This will be cells A23 through to A28 (the Discount slicer choices that we do not want reported as Revenue). 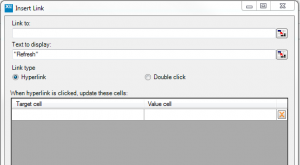 Click on the new exclusion row and then in lower half of screen build up the Revenue exclusion in the same way but remembering to point to the Excel range to cell locations A23 to A28. 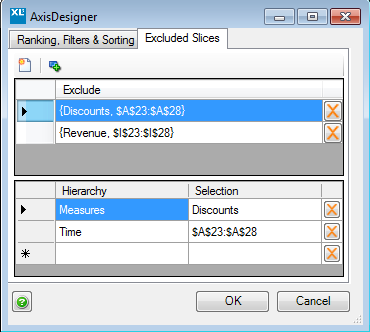 You should end up with an Axis Designer window something like this – for Discounts exclude slices in cell locations I23 – I28; for Revenue exclude slices in cell locations A23 –A28. OK to apply these changes and the report now looks like: As you can see the report shows Discounts for Quarters 2 & 3 in 2004 but only shows Revenue for Quarter 4 in 2004 and because everything has been linked to ranges driven by slicers, the user of the report can easily control the switch in measures. 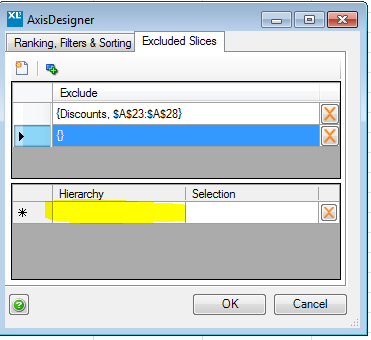 XLCubed has always provided a tree view selector to let users chose items from different levels in a hierarchy. 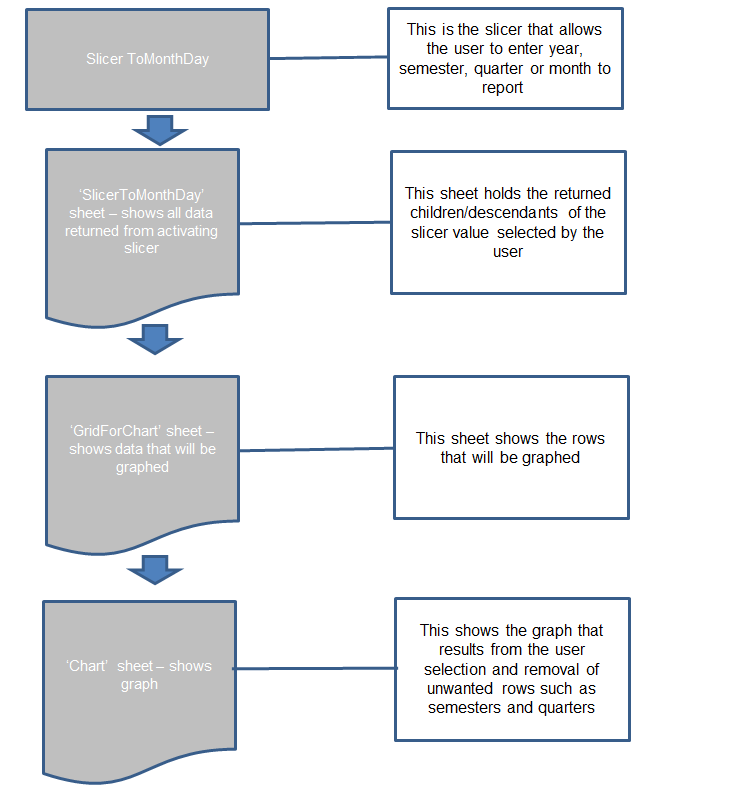 Previously, however, it was only possible to do this directly from a cube-based hierarchy. 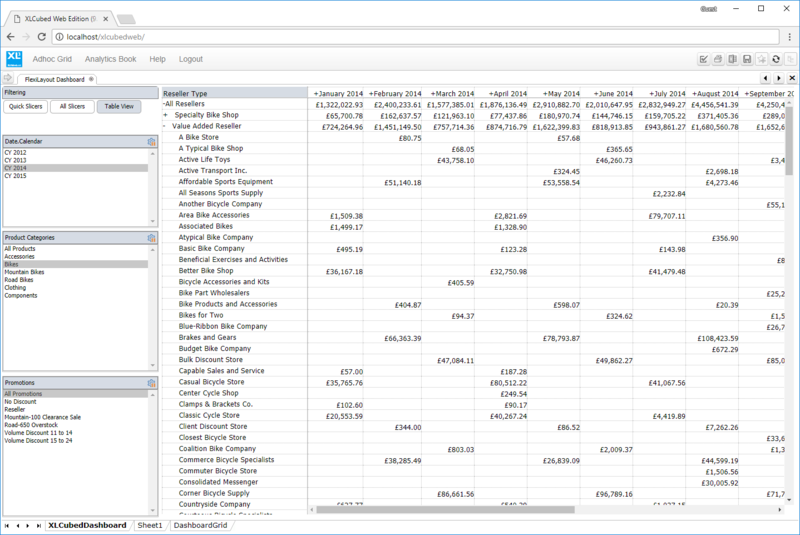 With the extension of our SQL reporting capability in V7 we found a few scenarios where we wanted to create tree views from non-cube data. 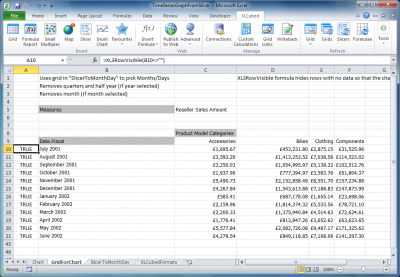 This can be easily achieved in Version 7 by using a slicer sourced from an Excel range. 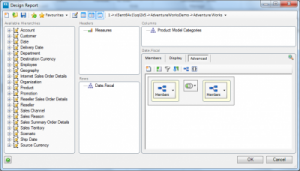 This can then be used to drive reports sourcing data from cubes, Tabular models, or SQL as required. As you can see we’re going with a food-based theme. 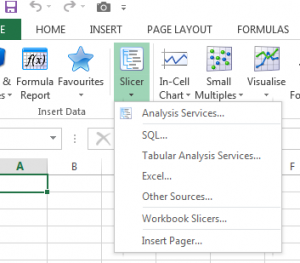 This Excel range needs to be in a specific format and so we have our list of slicer choices with the three required columns: key, value and depth. We’re happy with our list so from the XLCubed tab let’s select Slicer and then Excel which allows us to insert a slicer based on the data in our workbook. 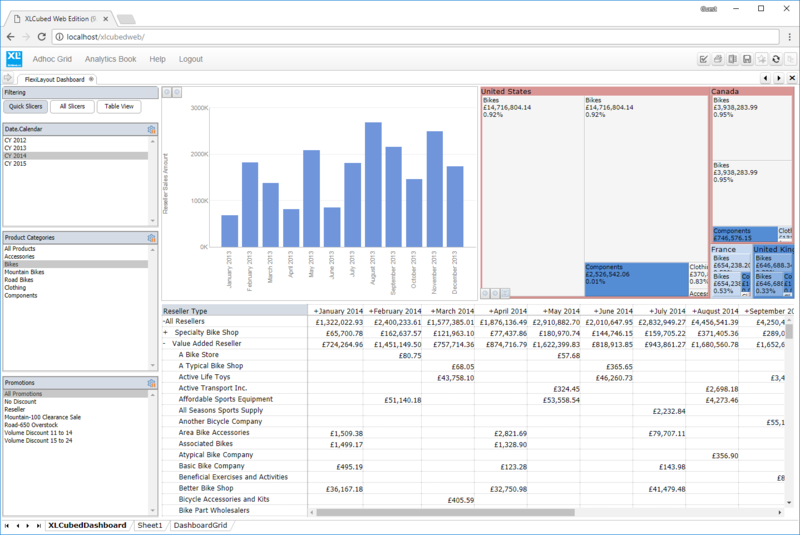 At this window we need to tell the slicer where to find the data (slicer range) in our workbook and the slicer type – in our case a tree view. In our example we are also giving the slicer a name ‘Food and Drink Slicer’ as well as instructing it to write the slicer selection to cell location $J$19. 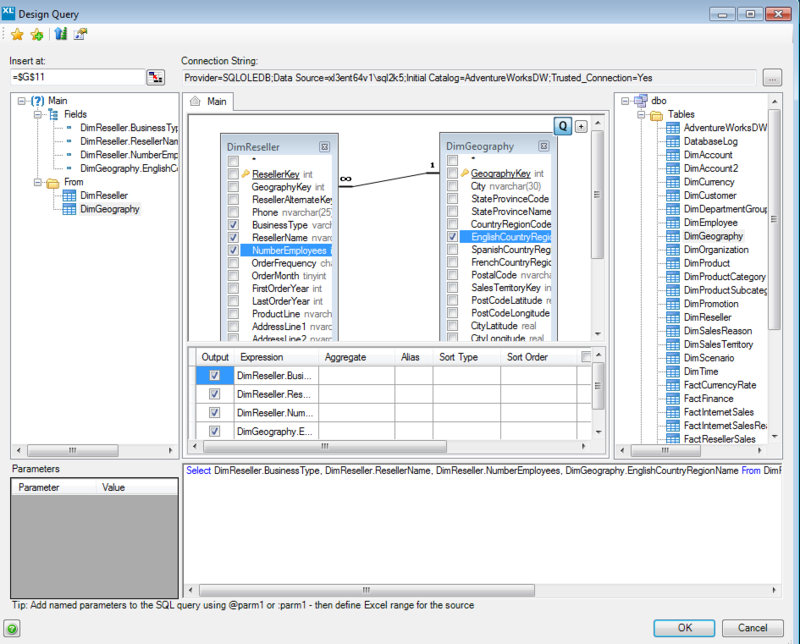 The resulting slicer looks like this and the user’s choice can then be used to drive any report, ranging from cube-based grids to DAX and SQL tables. We’ve been asked a few times in the last couple of months if we can build a ‘Previous / Next’ selector for date hierarchies, which allows the user to quickly navigate sequentially through months or days. 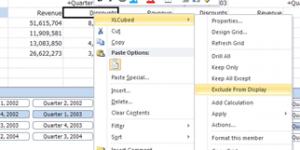 The answer is of course ‘yes’, otherwise it would be a very short blog..
One of the key strengths of XLCubed is it’s tight integration with Excel, and it means that with some creative thinking the answer is very rarely ‘no you can’t’. 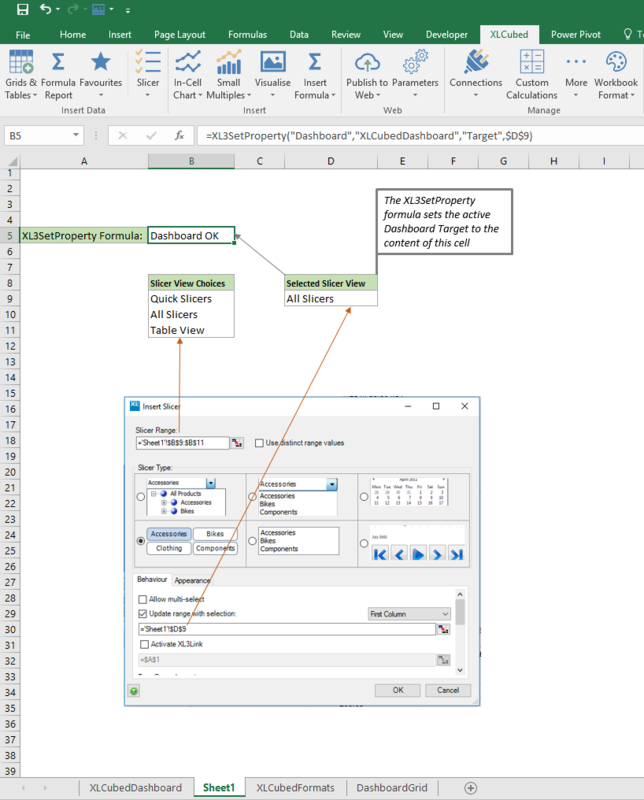 Here we use a combination of our slicers, the xl3membernavigate function, and standard Excel formulae to produce a very effective selector for just this scenario. A working example of this which connects to the sample bicycle sales local cube which we ship with the product is available here or you can view the online demo here. 1) Slicers are typically populated direct from the cube, which makes them very flexible and dynamic. 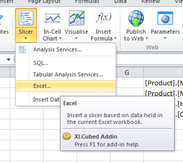 However a less well known aspect is that slicers can be driven from an excel range, and in this case that’s what we’ll be doing. 2) XL3MemberNavigate(). A fairly new formula which allows you to traverse a hierarchy dynamically in a multitude of different ways. Here we just scratch the surface. 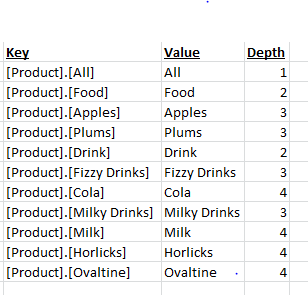 To begin with we need to prepare a range of cells in Excel to base the slicer on, in this case the months, and we also need to ensure it’s dynamic and can change with the underlying data structure. We need to prepare a table of similar structure to the below. 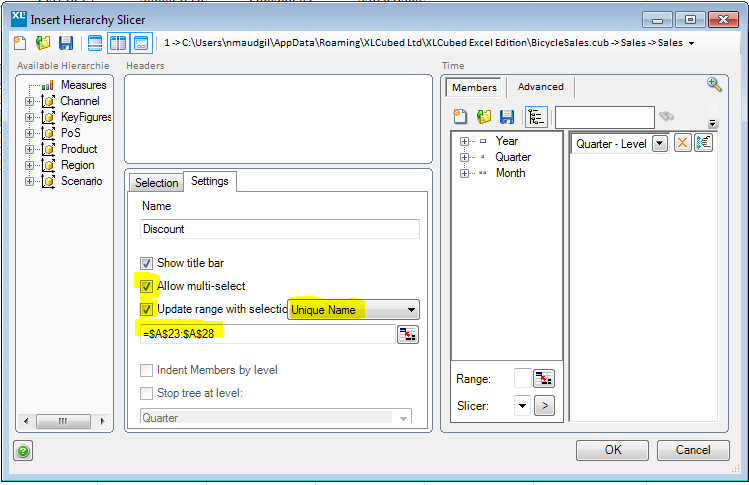 The month available for selection, determined by whatever the user chooses in the slicer, and the Xl3MemberNavigate formula (Insert Formula – Member Navigate) . Validation checks on the month to cater for when the first and last available months are selected. what will be displayed in the slicer dialog for user selection. The first month uses MemberNavigate to get the first available month. This is very straightforward in the MemberNavigate dialog, and will insert a formula in this syntax: XL3MemberNavigate(1,”[Time]”,”[Time].[Month]”,”FirstMember”). Last month is achieved the same way, but using ‘lastmember’. 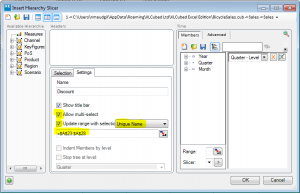 Previous and Next are again achieved using MemberNavigate, this time the syntax will be: XL3MemberNavigate(1,”[Time]”,SlicerData!$B$7,”Previous”). 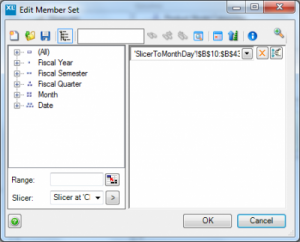 Displayed month is simply what the user has chosen in the slicer. Add a slicer from the XLCubed ribbon (or insert slicer menu in 2003). 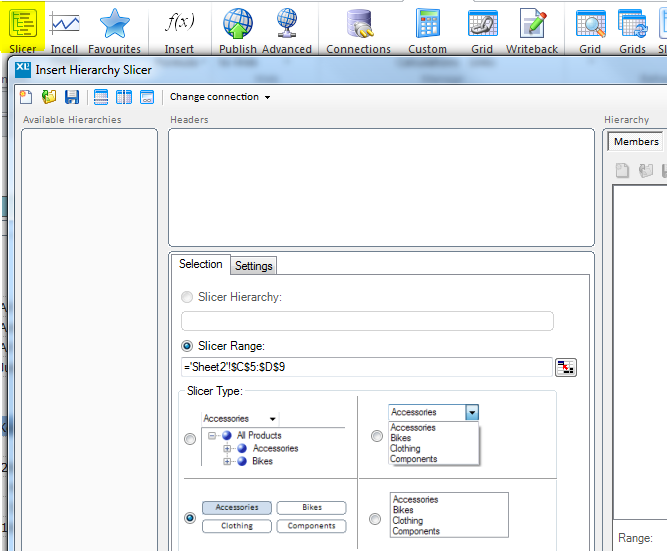 On the selection tab, choose ‘slicer range’ and select C5:D9 on the table shown above. Then set the slicer Type to be buttons. 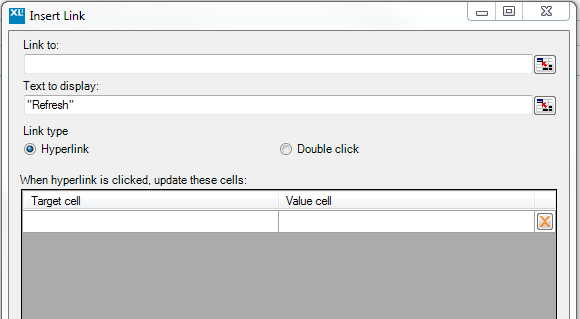 Lastly, on the settings tab, set the slicer to update cell B2 on the SlicerData sheet. 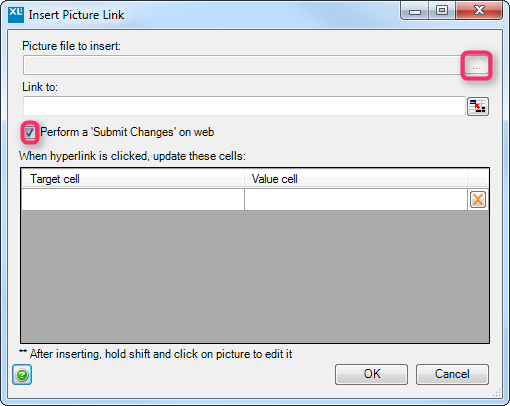 Optionally, you can also name the slicer and choose to show a title bar, as we have in this example. 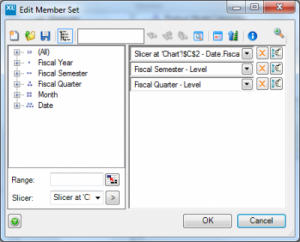 On inserting the slicer, you’ll need to resize the control itself, and possibly also the size of the buttons if the data member names are long. 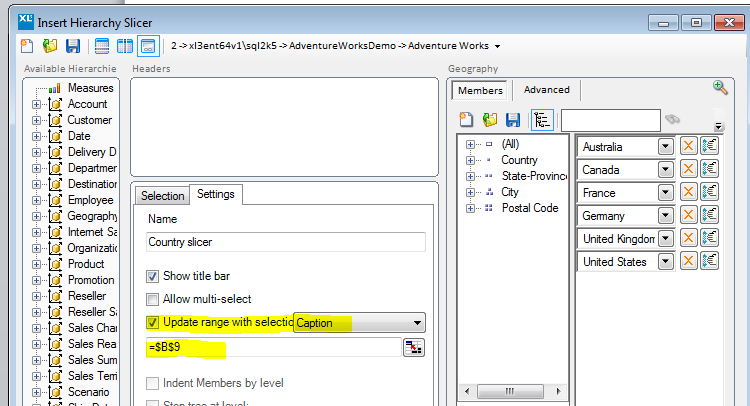 You should now have a slicer which enables Prev/Next selections, along with first and last. The slicer isn’t currently connecting to anything, or changing filters within a report. 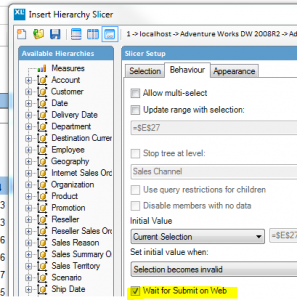 To do that, as it’s not directly connected to a hierarchy in the same way as a standard slicer, we need to go via the excel cell which it updates. 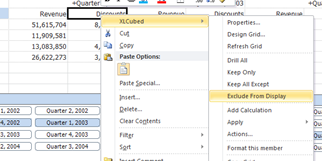 So any XLCubed grids or formulae need to reference the cell which the slicer outputs its selection to, in this case in this case SlicerData!$B$2. In our example we’ve just connected one grid, but there can be as many as required. Our example also gives some sales and costing detail for the main product categories. We also use in-grid sparklines to give a feel for the trend, and these can be drilled or sliced and diced in the same way as a standard grid. The working example can be downloaded here, or a similar version published to XLCubedWeb used online here.